Live morning announcements at school are fast replacing the traditional public address (PA) system. Delivering multisensory experiences, they are dynamic and exciting for presenters and audiences alike! 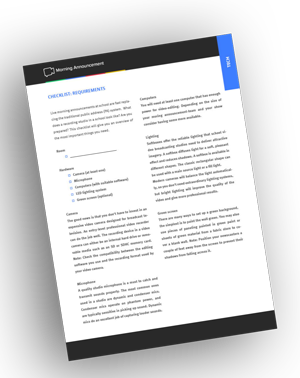 Whether viewed on classroom televisions or individual mobile devices, audio-visual announcements deliver an impact, help ensure a strong engagement rate, and build a greater sense of community. What is involved in a live school announcement? Besides picking interested pupils eager to hone their presentation skills, you need to create an appropriate studio environment that facilitates broadcast. This post is a 101 on recording studio equipment needed for successful morning announcements at school. What does a recording studio in a school look like? You don’t require a huge budget to set up a broadcast studio in your school premises. Schools that employ live announcements usually use a free classroom, reading room, or some available space to set up the studio. 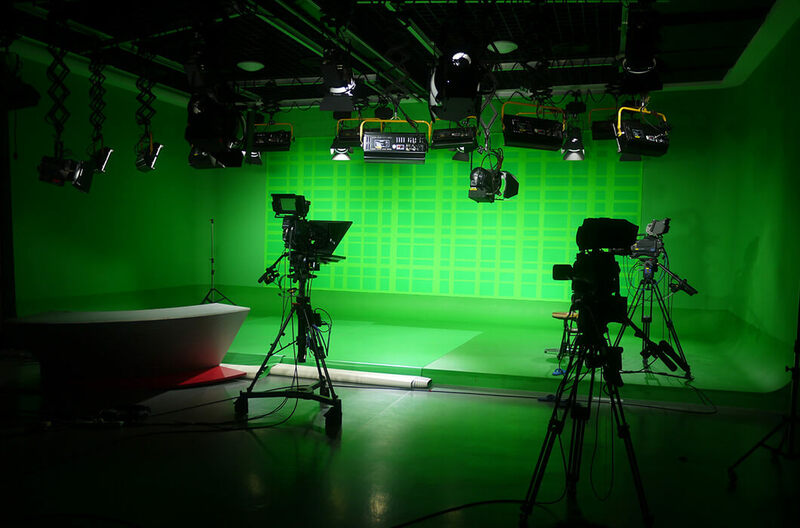 Basic equipment in a school studio includes an encoder, camera and a microphone. If you want to incorporate images or videos in the background, you will need a green screen. Of course, adequate lighting is also needed to render quality results. So, if you have a good LED lighting system, you’re off to a great start (there are other options as well). Let’s look at each recording studio equipment and element. Which kind of video camera? 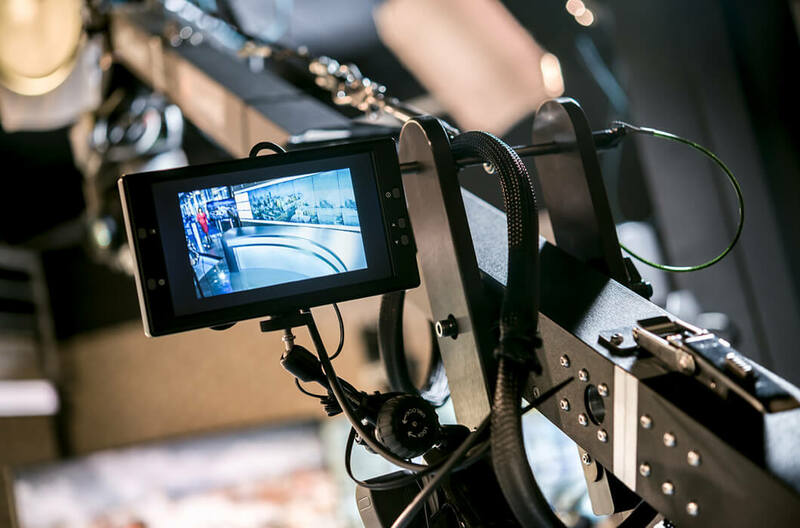 You don’t have to invest in an expensive video camera designed for broadcast television. An entry-level professional video recorder can do the job well. Look at the camera’s features to decide if you really need all of them; for instance, manual controls on cameras such as the Sony AX-2000 can set you back quite a bit. The much smaller and cheaper Panasonic HC-V180K Camcorder should suffice for school morning announcements. The recording device in a video camera can either be an internal hard drive or removable media such as an SD or SDHC memory card. No doubt removable storage is the better option, allowing the camera to be used anytime while you edit on the side. Check the compatibility between the editing software you use and the recording format used by your video camera. DSLR cameras with video capability are another option. As they offer good lenses and big sensors, they are good value for money. 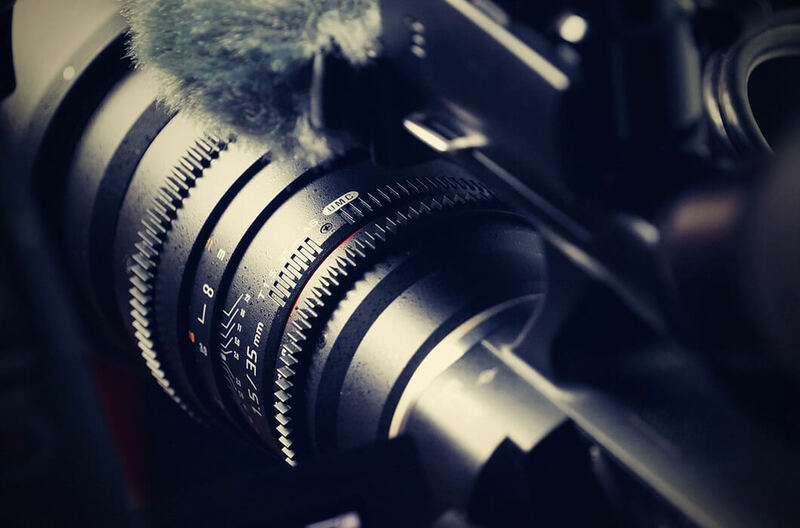 It is not uncommon to see DSLR-shot videos being used for television and movie production, so do explore this solution while making decisions on recording studio equipment. A quality studio microphone is a must to catch and transmit sounds properly. The most common ones used in a studio are dynamic and condenser mics. Condenser mics operate on phantom power, and are typically sensitive in picking up sound. Dynamic mics do an excellent job of capturing louder sounds. For a school studio environment, one option to consider is the built-in microphone in the video camera. However, depending on how far the presenters will be positioned in front of the camera, test to see if the microphone picks up sound bites audibly and clearly. If not, look at a camera that comes with a microphone input and external mic plug in. Even better if it has XLR inputs that accommodate external microphones. Alternatively, you can buy an XLR adapter to connect two microphones to a camera with just one mini-plug mic input. Can’t remember everything? No problem, we’ve got a checklist for you! What role does lighting play? Softboxes offer the reliable lighting that school video broadcasting studios need to deliver attractive imagery. A softbox diffuses light for a soft, pleasant effect and reduces shadows. It basically consists of a translucent cloth and attaches to a light source on a light stand. A white or silver cloth is used for the interior and a black one for the exterior. The cloth is wrapped around a diffusion panel. A softbox is available in different shapes. The classic rectangular shape can be used with a main source light or a fill light. Budget for at least two softboxes to sufficiently shine the spotlight on your news presenters/announcers. This is in addition to the LED or other lights illuminating the background. If you’re looking for the cheapest lighting option, clamp on lights – sockets on a stick – can do a decent job. In video recording, one area is isolated from the rest using a bright green screen. The reason for choosing bright green is that it is not commonly worn by talent, unless he/she decides to read out the news in a green leprechaun suit! There are many ways to set up a green background, the simplest is to paint the wall green. Or you can use pieces of paneling painted in green paint or sheets of green material from a fabric store to cover a blank wall. For a green screen to provide the right contrast and visual effect, it should be illuminated evenly throughout its length and breadth. Position your newscasters a couple of feet away from the screen to prevent their shadows from falling across it. Another tip is to shoot with a crisp focus as opposed to zooming in and out as you record. Inquire about different vendors in your area and get quotes from some to determine whose deal is most competitive. Make sure that the vendors’ sales representatives understand your requirements perfectly, and are aware of your existing equipment to suggest compatible choices. For the sake of convenience, you may want to buy different studio equipment from one vendor. As your single point-of-contact, the vendor can provide support when needed. Building a long-standing relationship with one technology vendor can also increase chances of getting good discounts and package deals. What do you need for your Morning Announcement? Did you think of everything? Our Checklist will help you to remember the most important stuff.